Many institutions and organizations are on a yearly budget, which means now is the time to request funding for any educational and professional development opportunities you have in mind for 2019. If you’re attending the ASHG 2019 Annual Meeting, the best way to get funding is to submit your request early, appeal to your institution’s mission, and fulfill any promises you make during your appeal when you return. With more professional development opportunities arising in the form of webinars, special-interest conferences, and service-learning, your department likely has a hard choice to make when deciding who and what to fund, even with an increased professional development budget. Many of these allocations are first come, first serve. Now is the time to do your research and put in those requests! Figure out approximately how much you’ll need to attend the event including travel, registration, and hotels. Not every conference or meeting will have registration open in time for your request, but ASHG shows the benefit of early registration by sharing prices and price increase timelines well ahead of the ASHG Annual Meeting. Many organizations, including ASHG, share hotel rates ahead of time. Booking flights early doesn’t always get you the best savings, but using tools like the Kayak Travel Hacker Guide will help you know when to start booking and what kind of price you can anticipate. Clearly indicate the financial savings of booking early and include all your research in your value of attending letter. Use our blog from last year to cut costs when traveling. The Return on Investment (ROI) Toolkit helps you convey that while this meeting will benefit you, it will also benefit your institution since they are supporting your attendance. Note which topics are being presented that directly correlate to your work. State that the meeting isn’t just a learning opportunity but is also valuable for networking and can increase the possibility to collaborate. Consider presenting your work, which would help get more visibility for your research and your institution. Most importantly, explain that you’ll be ready to share all this new information upon your return. Sharing your findings with colleagues increases the value of attending to your institution by increasing the number of people who benefit from the cost. See some other ways to get the most of a scientific meeting. Meetings can take a lot of energy, both mental and physical. Days full of new content can leave you burnt out and speechless when asked “what did you learn?” That’s why ASHG created several tools to help you keep track of it all. Track your participation on paper, or use our app! There are notes sections in each session listing where you can type about the session, and then email them to yourself later. We’re looking forward to collaborating with you in Houston, so use the ROI Toolkit and get moving on those value of attending letters! You’re reading part two of our three-part blog series on attending the ASHG Annual Meeting. If you want to check out part one about budgeting, click here. 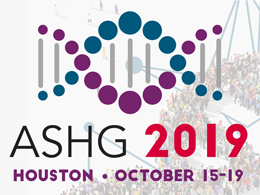 The ASHG 2018 Annual Meeting is getting closer each day, and advance registration is only open until October 15. This month, we’re going to talk about best practices for navigating a meeting or conference alone, and how to enjoy the process. If you’ve never attended an ASHG Meeting before, it might help you to look at materials from previous meetings such as blogs, videos, or tweets. Visualizing your setting is likely to relax some nerves. Planning your days helps you focus your attention on networking instead of worrying about where to go next. The printed Program-at-a-Glance includes a schedule overview, scientific session information, and maps of the convention center. Check the schedule online, and learn about the app in advance. Know your limits! If you feel like you’re overextending yourself, then go to a relaxing place to unwind for an hour. You’ll get more value out of the rest of the day if you take that time. Think about where that relaxing space is for you, whether it’s your hotel room, your car, a coffee shop around the corner, or the inspiration lounges. ASHG also has a Prayer & Meditation Room at the meeting each year. Wear clothes that you feel confident in. When you feel confident, you’ll act more confident, and you’ll be ready to mingle. Think sensibly when it comes to footwear. Talk about subject matter that interests you, and chances are you’ll find someone who has similar interests. Posters are organized by scientific topic, so if you’re presenting a poster, you’ll be surrounded by people with similar interests. Many attendees don’t come with colleagues, so you’re not actually alone. You’re surrounded by friends you’ve yet to meet! Think about where people are likely to be looking for some conversation filler: in line for an event or food, or waiting for a session to start. There are many social events built into the meeting, such as: the opening reception; ancillary, satellite, exhibitor events; and inspiration lounges. Use the online schedule filter to see ancillary events, or ask exhibitors directly if they will be hosting something. Trainees should check the trainee events page and watch the video below. Use twitter to find fellow attendees by using the social media badges, the meeting hashtag #ASHG18, and the trainee hashtag #ASHGTrainee. People are often on Twitter looking for exercise partners and sightseeing buddies. You can also attend the Tweetup social event. The most important thing to remember when attending alone? Everyone is in it together! If you’ve never attended a meeting or you’ve attended a dozen times, there are new people all around you just as interested in mingling as you are. Come meet our friendly staff at ASHG Central throughout the entire meeting. We can’t wait to see you there! “What are your plans after PhD”? – one of the most daunting and stressful questions often asked to graduate students. For many pursuing a career in academia, the obvious next step is a postdoctoral position. The ideal time to start applying for postdocs is one year away from your graduation. At the beginning of the final year of my PhD, I made a list of institutes to explore. Based on this list, I directly contacted the principal investigators (PIs) whose work I found really exciting. After hearing back from them, I arranged a meeting with them to learn about their research. This provided a wonderful opportunity to network and establish professional relationships with them. I also found the Conference to Career chat sessions with field experts extremely useful. At one of the sessions, Prof. Fred Winston shared very useful tips on setting criteria for choosing a postdoc lab, such as quality of mentorship, success rate of previous postdocs in academia, and publication rate of the lab. If you start early you are more likely to end up with multiple offers by the time you finish your PhD. Starting a postdoc hunt can be overwhelming, given the numerous places a graduate student can potentially apply to. It can become easier if you can think about where (geographically) you would like to do a postdoc. After identifying a region, you just have to locate the productive labs that do the science that you find exciting. If you are going to a conference, write to PIs beforehand whose work you find interesting. Network with them by inviting them to your poster and follow up with them afterward. Visit lab websites of PIs who you are interested in working with and pay close attention to the lab’s current interests required skills for postdocs. Use this time to develop a skill that will increase your visibility as a potential candidate. Write PIs an informal query about potential postdoc positions to PIs, including your CV and cover letter, and get your material proofread by your mentor and colleagues. Showcasing your PhD research is a great way to convince future PIs about your skills and your ability to lead a project independently. If you have a paper ready to be submitted to a journal, get its preprint out on bioRxiv and mention it on your CV. If you are contacting a field expert, openly ask for feedback and advice about your current research project. This is a great way to interact and establish professional relationships with PIs. Finally, get out of your comfort zone. Aim higher but be realistic. Keep applying until you land an offer from your dream lab. I would also recommend attending the ASHG/JAX Conference to Career Program for honing your networking skills. Acknowledgments: I am highly thankful to my supervisors Jenny Barrett, PhD; Julia Newton-Bishop, MD, MBChB, FMedSci; Jeremie Nsengimana, PhD; and Göran Jönsson, PhD, for their exceptional mentorship; and European Commission Horizon 2020 program for funding my PhD. Rohit Thakur, B. Tech, is a PhD Candidate at the University of Leeds. He has been an ASHG member since 2017. Networking Session was Great! What’s Next? During ASHG 2017, I participated in the Conference to Career program, organized by ASHG in collaboration with The Jackson Laboratory. The program taught various skills such as networking, elevator pitches, informational interviewing, and how to follow up effectively, some of which I highlighted on the MELGEN blog last month. Today, I wanted to focus on the aftermath of networking: The art of following up! Before I start recommending strategies, I wanted to share my experience of how effective follow-up can lead to wonderful opportunities. During the ASHG meeting, I was intrigued by a talk by Manolis Kellis, PhD, after which I prepared my elevator speech and talked to him about his group’s ongoing research. I was very interested in their machine learning approaches. Dr. Kellis was very kind and put me in touch with his graduate student. After returning from the conference, I followed up with Dr. Kellis, and that led to potential talks of collaboration between our groups. Dr. Kellis also offered to host me for a month-long internship in his group at MIT, which I accepted. From my limited experience, I can say that effective follow-up is a necessary step towards building a strong network. Here are some recommended strategies. Follow up with people after networking by sending a personalized email within the next 24 hours, while the meeting is fresh in their minds. This email should include a thank you note and all the relevant information – articles, programming scripts, and anything else you had agreed to share after the networking session – and express interest in scheduling another meeting. Social media has made it easy to connect with people from around the world, through platforms like Twitter, LinkedIn, and ResearchGate. You can keep in touch by congratulating them for their recent achievements and recognitions, and wish them on other occasions such as birthdays, and the New Year. If you are fascinated by someone’s work, you can always invite them for a department seminar. As a trainee, you can recommend speaker names to the head of your department suggesting why they should be invited and how it will benefit your department’s research. Not only will this strengthen your relationship with the speaker, but will also help in fostering collaborations between other trainees/researchers and the speaker. Networking is a team sport. You can follow up with people by offering them your help and suggestions in a constructive manner. If following up leads to a successful collaboration, then you should always give equal opportunity in decision making, leadership, responsibilities, and benefits. Acknowledgements: My project has received funding from the European Union’s Horizon 2020 research and innovation programme under the Marie Skłodowska-Curie grant agreement No 641458. I am highly thankful to my supervisors Jenny Barrett, PhD, Julia Newton-Bishop, MD, MBChB, FMedSci, Jeremie Nsengimana, PhD, and Göran Jönsson, PhD, for their exceptional mentorship and encouragement to expand my horizons. I am thankful to the organizers of the Conference to Career Program for developing networking skills of ASHG trainees and to Dr. Kellis for providing me with a wonderful learning opportunity in his group at MIT. This year, ASHG and the Federation of American Societies for Experimental Biology (FASEB) are offering a newly structured travel award for underrepresented* trainees who are full-time undergraduate, graduate, medical students, and postdoctoral/clinical fellows who attend ASHG 2017. Applications are due August 31, 2017 at 5:00 pm U.S. Eastern Time. Email questions and completed applications to marcssm@faseb.org. What makes this travel award unique is its goal is to provide engaged and structured mentoring for trainees attending the meeting. This is fostered by assigning each awardee a peer mentor based on common interest. The mentorship process starts before ASHG 2017 and continues during and after the meeting. Peer mentors will begin communicating with awardees before the meeting through a series of activities, including helping awardees choose events and sessions to attend and establishing their career interests to customize the meeting experience. During the meeting, awardees will practice their presentations with their peer mentors and receive feedback. Peer mentors will also help awardees identify Exhibit Hall booths to visit based on their career interests, attend a social event together to practice networking, view poster and platform presentations to learn how to ask questions, and critique presentations. After the meeting, peer mentors will follow up with awardees by continuing to provide professional development support. Peer mentors are selected based on their experience attending the meeting and their proximity in career development to the trainee awardee, which makes the relationship more relaxed. We have selected a diverse group of mentors spanning academia, industry, medicine, science education, and non-profits. The travel award provides up to $1,850 in reimbursable funds for registration and travel. Applicants are required to submit and present (poster/oral) at ASHG 2017. Eligible applicants must be United States citizens or permanent residents with legal status. Trainees can be from minority institutions and historically black colleges and universities (HBCUs) or underrepresented trainees from majority institutions. Preference for the award is given to ASHG members. Kanika Pulliam, PhD, is ASHG’s Educational Programs Manager. Learn more about ASHG’s programs for trainees, including programs at ASHG 2017. Conferences offer a variety of networking events you should fully take advantage of, but keep in mind that scientific sessions and visiting the exhibit hall can also provide new opportunities. Before attending a conference, it is always a good idea to glance at the agenda and mark workshops of interest. Identify speakers whom you would like to meet. Each conference is unique because each offers various workshops, resources for different career levels, and receptions that allow you to network in a safe space. There is no need to feel shy or stay quiet at a conference; you can always ask questions. Use this time to explore, learn, listen, and communicate. Each conference I’ve attended has provided me with great opportunities that I would have never imagined. I have learned to feel more confident while presenting my research. Was I nervous? Of course, but the more I practiced, the more comfortable I felt. Constructive feedback from people who visited my posters or talks has helped me improve my presentation skills. I was asked questions that provided me with great ideas about what to do next in my research project. Presenting a poster or an oral presentation at a conference can also be a good way to interact with people at various career levels, which may lead you to discover similar interests. Be ready with your elevator pitch about your research (a minute or two) and your own branding statement (a simple statement). No need to be arrogant but in simple terms, describe who you are and your interests. Most conferences have an exhibit hall with vendors, institutions, resources, and career centers. Take advantage and visit them. This can help improve your networking skills or spark ideas for the next step of your career. By strolling around conference exhibit halls, I have learned about summer internships, scholarships, fellowships, post-baccalaureate programs, and graduate schools. Now, I learn about new job opportunities or professional/leadership training opportunities. You never know whom you will meet or what you can learn from a conversation with a stranger. So make sure you have a plan but also go with the flow and enjoy every minute of your conference experience. Don’t stress about it. At conferences, I have met people who became life time friends and wonderful mentors who have been instrumental in my career through their advice and support. Please check out the ASHG website for more information on trainee opportunities, resources, and ASHG 2017. Teresa Ramírez, PhD, is the 2016-2017 ASHG/NHGRI Genetics & Education Fellow. Learn more about the Genetics & Education Fellowship.